Popular Chinese drone maker DJI has sent out press invites for its ‘See the Bigger Picture’ event, where it is expected to unveil the DJI Mavic 2 Pro and Zoom drones. The event will be held in New York City at 10 AM EST on Thursday, August 23. DJI had originally scheduled the event for July 18, but delayed it because the standard of innovation on the new drones didn’t live up to the company’s expectations. DJI will officially tell the world about its newest DJI Mavic 2 Pro and Zoom drones on August 23, but the rumor mill and many of its retail partners have already leaked tons of details. Let’s take a look at all the major leaks about DJI’s upcoming drones ahead of the big event. German electronics retailer GFU had accidentally published two zip files on its website showing the DJI Mavic 2 Pro and Zoom in high resolution. The retailer has since removed the zip files, but not before it was spotted by Twitter user Cortis Photographie (via DroneDJ). Images in the zip files showed both the drones from the front. 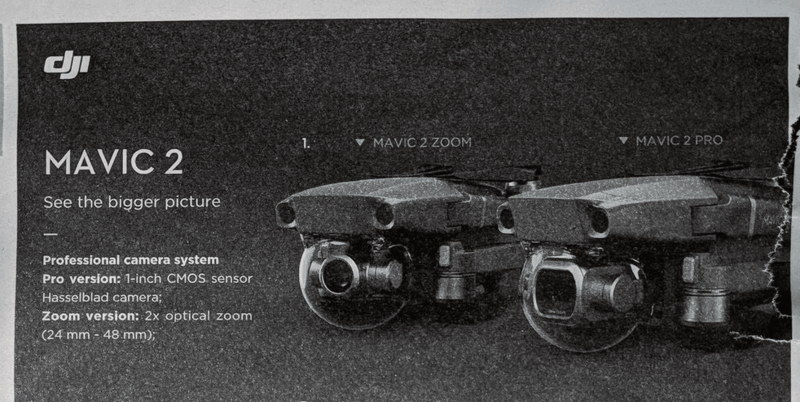 They also included some text about the two drones. According to the zip files, the DJI Mavic 2 Pro will be the “world’s first drone” with an integrated Hasselblad camera that would offer “outstanding image quality with superior light and color performance.” The 1-inch Hasselblad CMOS sensor with a 10-bit color profile will allow the camera to capture “four times as many levels of color per channel” as the previous generation Mavic Pro. 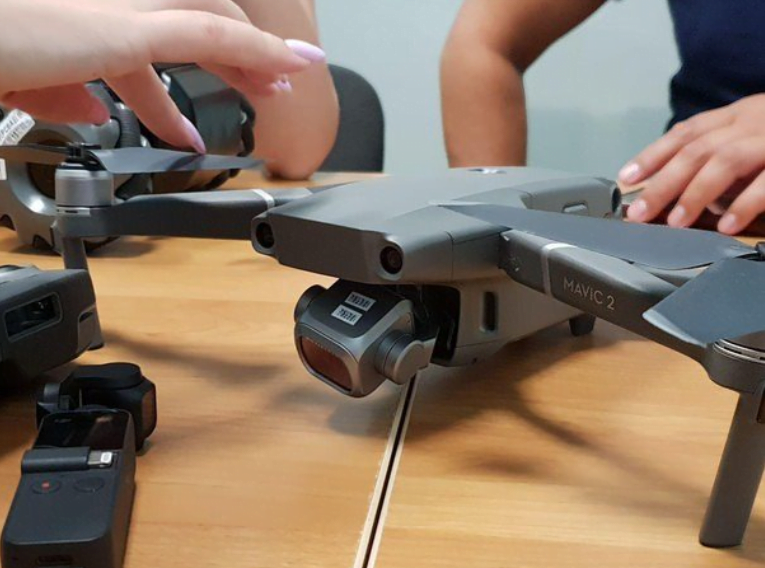 Last month, British retailer Argos had accidentally shared the catalog for DJI Mavic 2 Pro and Zoom models, revealing their key specifications. According to the Argos catalog, both the drones will have a range of 5 miles and a top speed of 45mph. Both of them will have the same battery life of 31 minutes. Also, both the drones will be able to live stream 1080p HD videos. Further, the Argos catalog revealed that both the upcoming drones would offer 360-degree obstacle avoidance system. They will feature “omnidirectional obstacle sensing” with Active Track 2.0 auto-tracking technology and Advanced Pilot Assistance Systems (APAS). The drones will have sensors on the front, back, sides, and the bottom for obstacle avoidance. Both the drones would retain the basic design characteristics of the previous Mavic Pro. The propeller motors appear larger than on the Mavic Pro. In another leak, DroneDJ has obtained a leaked image comparing the specifications of DJI Mavic 2 Pro and Zoom with that of Mavic Pro. 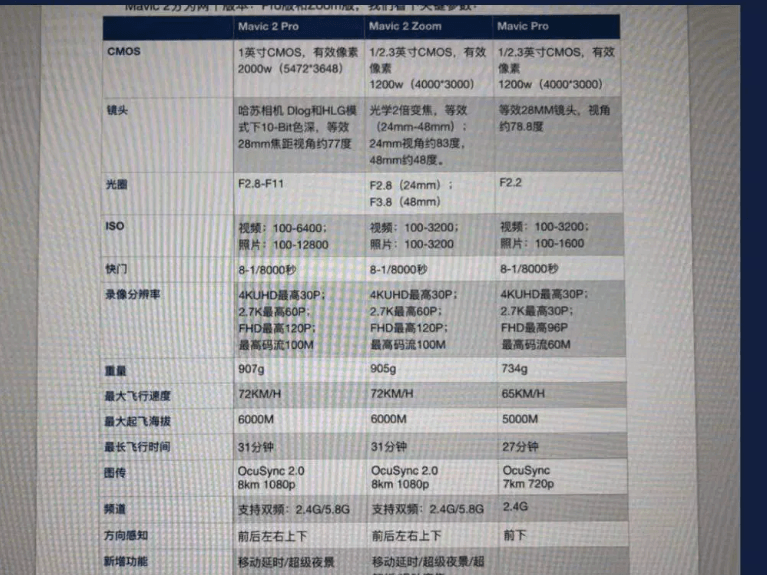 Per the leak, the Mavic 2 Pro weighs 907g and the Zoom weighs 905g, much higher than the original Mavic Pro’s 734g. Despite the added weight, the new drones will have a maximum speed of 45mph, a flight time of 31 minutes, and the peak altitude of 3.75 miles. Thanks to OcuSync 2.0, they will be able to stream 1080p videos up to 5 miles. This leak reiterates earlier rumors that the new drones will offer advanced omnidirectional obstacle avoidance system. It reveals that the DJI Mavic 2 Pro will have a 20MP 1-inch CMOS sensor with a 5,472 x 3,648 resolution, a 28mm wide-angle lens, a 10-bit video codec, and variable mechanical apertures. It will capture 4K UHD videos at 30fps, 2.7K videos at 60fps, Full HD videos at 120fps at 100Mbps. As for the Mavic 2 Zoom, it has a 1/2.3 CMOS sensor with a 24-48mm optical zoom lens, variable apertures of f/2.8 and f/3.8, and a resolution of 4,000 x 3,000. It will shoot 4K UHD videos at 30fps, 2.7K footage at 60fps, and FHD videos at 120fps. It means either Mavic 2 Pro not Mavic 2 Zoom will offer 4K video recording at 60fps, which many consumers were expecting. There haven’t been any reliable leaks on the pricing. But we expect the new drones to be priced in the same range as the Mavic Pro, starting at around $1,000 in the US. A more premium pricing could sway consumers away from the Mavic 2 Pro and Zoom to Mavic Air.